William Charles Wentworth (13? 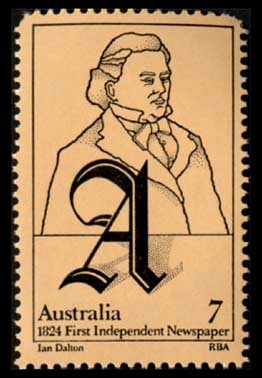 August 1790 – 20 March 1872) was an Australian poet, explorer, journalist and politician. He was one of the leading figures of early colonial New South Wales. He was the first native-born Australian to get a reputation overseas. He wanted self-government for the Australian colonies. In 1796 Wentworth arrived in Sydney. It was then a poor prison settlement. The family lived at Parramatta. His father became a prosperous landowner. In 1802 he was sent to England. He went to a school in London. He returned to Sydney in 1810. He was appointed acting Provost-Marshall by Governor Lachlan Macquarie. He was given a land grant of 1,750 acres (7 km2) on the Nepean River. On 15 October 1810, at Hyde Park, Wentworth won the first official horse races on Australian soil. In 1813 Wentworth, along with Gregory Blaxland and William Lawson, led the trip which found a route across the Blue Mountains. The town of Wentworth Falls in the Blue Mountains is named for him. As a reward he was given another 1,000 acres (4.0 km2). Wentworth returned to England in 1816. There he was admitted to the bar, travelled in Europe, and studied at Cambridge University. In 1819 Wentworth published the first book written by an Australian: A Statistical, Historical, and Political Description of the Colony of New South Wales and Its Dependent Settlements in Van Diemen's Land, With a Particular Enumeration of the Advantages Which These Colonies Offer for Emigration and Their Superiority in Many Respects Over Those Possessed by the United States of America. He said there should be an elected assembly for New South Wales, trial by jury and settlement of Australia by free emigrants rather than convicts. A new Britannia in another world! Wentworth returned to Sydney in 1824. He was joined by Robert Wardell. His father died in 1827 and William inherited his property. This made him one of the wealthiest men in the colony. Wentworth became Vice-President of the Australian Patriotic Association and founded a newspaper, The Australian. It was the colony's first privately owned paper. He was elected to the Council in 1843 and soon became the leader of the conservative party. He was against the liberals led by Charles Cowper. In 1853 Wentworth chaired the committee to draft a new constitution for New South Wales. In 1856 Wentworth retired from the Council and settled in England. The towns of Wentworth and Wentworth Falls, the federal Division of Wentworth, an electorate in Sydney's Eastern Suburbs, the Wentworth Falls waterfall, and Wentworth Avenue which runs through the suburb of Kingston in Canberra, were named after him. 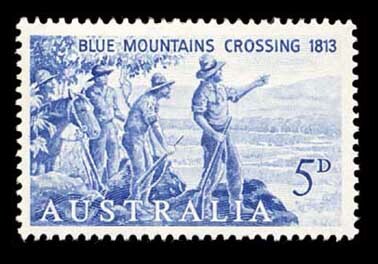 In 1963 he was honoured, together with Blaxland and Lawson, on a postage stamp issued by Australia Post showing the Blue Mountains crossing, . Another stamp was issued again in 1974 on the anniversary of the first newspaper publication. The Wentworth Building, where University of Sydney Union resides, was named after William Wentworth. ↑ 1.0 1.1 1.2 Michael Persse (1967). "Wentworth, William Charles (1790 - 1872)". Australian Dictionary of Biography, Volume 2. MUP. pp. 582–589. Retrieved 2007-08-14. This page was last changed on 9 April 2019, at 00:31.